THE compilation of this work was begun by Bishop Young more than twenty years before his lamented death, a very large portion of it having been stereotyped before his election to the Episcopate of Florida. The pressure of new duties and responsibilities interrupted its completion; but at length it was resumed, and some further progress was made. A few days before his departure, he expressed the desire that, should he leave the work incomplete, it should be put into my hands to see it through the press. I had been familiar with it from its first beginning, and in some parts of it had given such cooperation as I could. The message came to me as the dying request of an old and dear friend, and I could do nothing but consent. 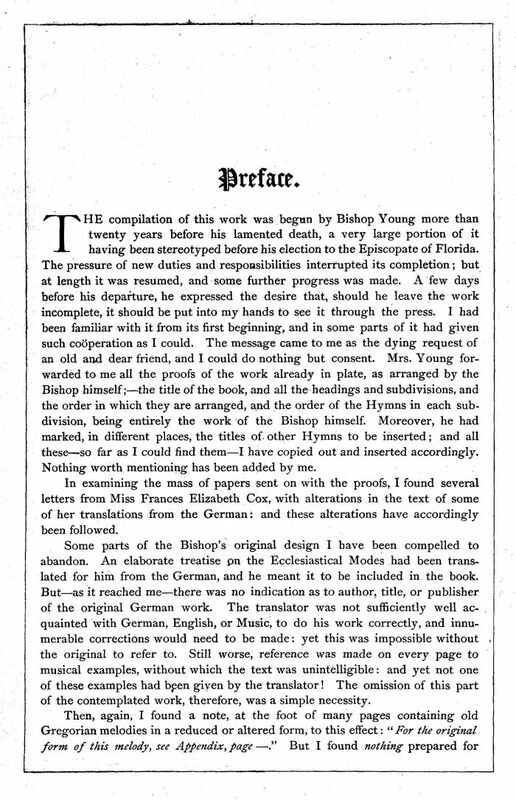 Mrs. Young forwarded to me all the proofs of the work already in plate, as arranged by the Bishop himself ;—the title of the book, and all the headings and subdivisions, and the order in which they are arranged, and the order of the Hymns in each subdivision, being entirely the work of the Bishop himself. Moreover, he had marked, in different places, the titles of other Hymns to be inserted; and all these—so far as I could find them—I have copied out and inserted accordingly. Nothing worth mentioning has been added by me. In examining the mass of papers sent on with the proofs, I found several letters from Miss Frances Elizabeth Cox, with alterations in the text of some of her translations from the German: and these alterations have accordingly been followed. Some parts of the Bishop’s original design I have been compelled to abandon. An elaborate treatise on the Ecclesiastical Modes had been translated for him from the German, and he meant it to be included in the book. But—as it reached me—there was no indication as to author, title, or publisher of the original German work. The translator was not sufficiently well acquainted with German, English, or Music, to do his work correctly, and innumerable corrections would need to be made: yet this was impossible without the original to refer to. Still worse, reference was made on every page to musical examples, without which the text was unintelligible: and yet not one of these examples had been given by the translator! The omission of this part of the contemplated work, therefore, was a simple necessity. Then, again, I found a note, at the foot of many pages containing old Gregorian melodies in a reduced or altered form, to this effect: "For the original form of this melody, see Appendix, page —." But I found nothing prepared for any such Appendix; and, the materials in my possession being insufficient to supply what was needed, that part of the original plan has necessarily been dropped also. For the greater part of the work, the proof-reading was done by the Bishop himself, and the text of Greek and Latin and German Hymns is here given as he left it. The very large use made by him of the musical skill of Mr. Herman R. Schrœder, both in composing and in arranging, is evident on the slightest inspection; and this was completed by the musical proof-reading of the same accomplished veteran in the knowledge of Ancient Church Music. The obligations to the learned work of Dr. F. Layriz are also very extensive. From letters in the mass of papers sent me, the Bishop seems to have been very careful as to the legal rights of composers and authors: and if it shall appear that, in any case, these have been trespassed upon, I can only beg the parties aggrieved to be assured that the trespass has been unintentional. 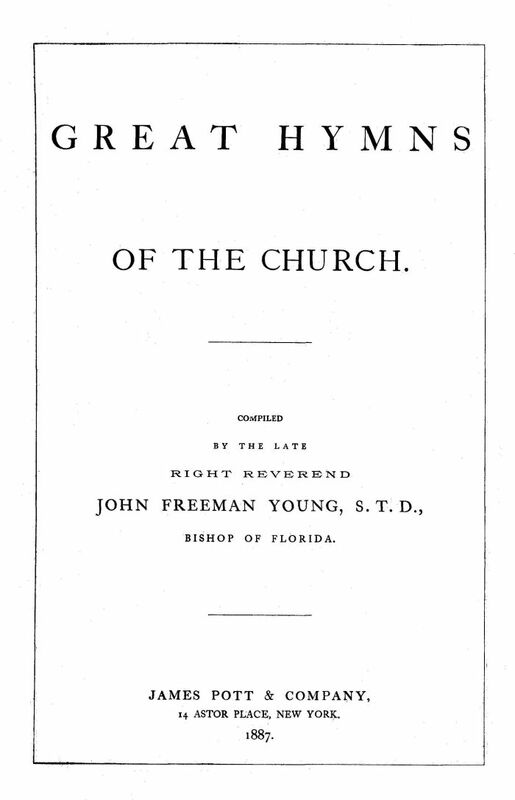 In some few cases, Hymns have been inserted—as Bishop Young left them for insertion—without the words in the original language, and without any indication of the source from which the Melody was taken. These missing things he, doubtless, intended to supply, and would have supplied had he lived, but it has not always been in my power to make up for the loss, and 1 have, therefore, printed these Hymns as they stood. 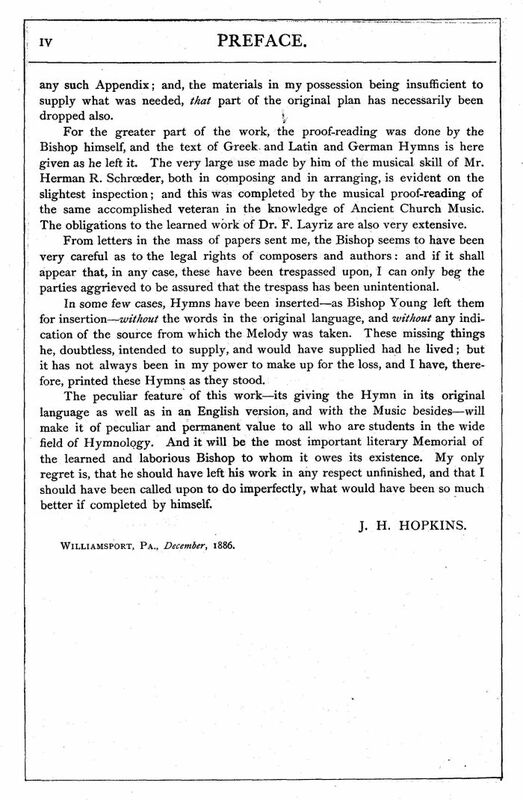 The peculiar feature of this work—its giving the Hymn in its original language as well as in an English version, and with the Music besides—will make it of peculiar and permanent value to all who are students in the wide field of Hymnology. And it will be the most important literary Memorial of the learned and laborious Bishop to whom it owes its existence. My only regret is, that he should have left his work in any respect unfinished, and that I should have been called upon to do imperfectly, what would have been so much better if completed by himself.